The Israel Lobby and American Policy conference was solely sponsored by the American Educational Trust, publisher of the Washington Report on Middle East Affairs, and the Institute for Research: Middle Eastern Policy (IRmep). This is a rush transcript. Dale Sprusansky: I would like to introduce Grant Smith of the Institute for Research: Middle Eastern Policy, a co-sponsor of this event. Grant and his organization are committed to uncovering and documenting how the Israel lobby works and operates through its research and its Freedom of Information Act requests. Grant is the author of several books on the lobby, his most recent being Big Israel: How Israel’s Lobby Moves America. That book is available for sale at our bookstore and is also now available online as an audiobook. So with that, I’d like to welcome Grant to the stage who will provide an overview of the lobby and of today’s events. Thank you. Grant Smith: Thank you, Dale. Welcome, everybody. As he said, I’m going to be reviewing the Israel lobby’s agenda in some detail. It explains, I think, best why we’ve invited this particular group of experts to speak today. I’ll try to mention as many of them as I can as we review the stakes, the very high stakes, and challenges that are being presented here in the United States and globally which are higher than ever before. The Israel lobby, in terms of a nonprofit sector snapshot – and this is coming out of the database that was compiled for my book Big Israel – is an ecosystem of organizations that advance Israel at very many levels. This is on track to be a $6.3 billion industry in 2020. Nearly 500 separate medium-sized to major organizations – with, certainly, AIPAC and the American Jewish Committee and the Anti-Defamation League and many others at the top – but if you add it up, it’s almost 17,000 employees, half a million volunteers working in organizations that have the advancement of Israel as one of their primary objectives in the United States. Their designated voice, as Dale mentioned, leveraging the collective power of these grassroots integrated organizations is the American Israel Public Affairs Committee, and it will of course be meeting in its annual policy conference this weekend. So there’ll be a great deal of triumph in the achievement of one of its longest term objectives, which was realized in President Donald Trump’s recognition of Jerusalem as Israel’s capital. Now the announcement was followed by a State Department announcement saying that the U.S. Embassy will be moved to Jerusalem in May. It’s something that, since its founding in 1948, Israel has wanted all countries to do – to give official recognition, locate their embassies in Jerusalem, rather than Tel Aviv. But of course the original 1947 partition plan of Palestine into Arab and Israeli states required that Jerusalem be internationalized. Both Palestinians and Israelis want Jerusalem to be their capital. AIPAC got serious about passing a highly coercive move – the embassy law – in the 1990s. They did it to thwart the Oslo peace process, which had its own problems. But by creating facts on the ground, the Zionist Organization of America and AIPAC hoped that they could pre-empt any moves from the Oslo peace accords. They got their law – which had a presidential waiver provision to avoid constitutional separation of power issues. President Clinton allowed the Jerusalem Embassy Act of 1995 to pass without signing it. Then, for two decades, the Israel lobby pressed presidential candidates to promise to move the embassy as part of their campaign – and most of them, of course, did it. On the Democratic Party side: Joe Biden, Jimmy Carter, Bill Clinton, Hillary Clinton. The Republican side: George W. Bush, Ted Cruz, Bob Dole. But every winner of the office signed a waiver every six months not to move the embassy, and so the Jerusalem Embassy Act again required that the State Department not be allowed to use its overseas construction budget until this was done. But presidents waived it every six months – until President Trump overturned all of that, and recognized Jerusalem as Israel’s capital and said that the U.S. will move the embassy. Americans have never supported this. Upon the Trump administration’s announcement, 36 percent of Americans polled by CNN said that they supported recognizing Jerusalem as Israel’s capital. When polled, 57 percent of Americans in January of 2017 said that they were opposed to moving their embassy from Tel Aviv to Jerusalem. So the U.S. is becoming Israel’s designated arbiter of territorial claims, I would say, via the power of the Israel lobby. George W. Bush even signed a letter to Prime Minister Ariel Sharon saying that he didn’t expect them to withdraw from certain territories if they didn’t want to. So this has been something that’s been a while in coming. But the question is, can the U.S. really be considered to be a legitimate actor in making these territorial declarations and bestowing legitimacy because the lobby wants it? The embassy move and related measures, such as cutting U.S. assistance to Palestinian refugees and the U.N. and others, is why we have a real panel of experts coming up to talk about the United Nations and other important issues. Agenda #2: The Israel lobby would very much like to pass a federal law mandating that criticism of Israel in some cases is equivalent to anti-Semitism. The Anti-Semitism Awareness Act is an expansive U.S. State Department definition of what anti-Semitism is – also crafted by Israel lobby organizations – which is designed to clamp down on criticism of Israel, particularly on college campuses. So Israel lobby organizations backing such laws want to be able to say that certain criticism under this State Department definition is anti-Semitism, and that federal funding should be withdrawn from higher education in certain cases if it’s allowed to happen. When advised that major American civil liberty groups such as the ACLU are opposed to this law, 61 percent of Americans also opposed this particular measure – cutting off assistance to higher education. To discuss this, we have Dr. Barry Trachtenberg, a Holocaust scholar and author of the new book The United States and the Nazi Holocaust, who testified before the House Judiciary Committee on Nov. 7th to discuss the real politics behind the Anti-Semitism Awareness Act. We’ll also hear from the eminent scholar Dr. Rabab Abdulhadi, who prevailed in a lawsuit filed against her which some people believe, including me, that she might not have if this federal law had been in place. This is not the only Israel lobby gag law that’s in place. There’s a legislative rule with the force of law currently in effect through the Department of Energy that says any government contractor or employee cannot publicly say or write that Israel has a nuclear weapons program under penalty of losing their job, their security clearances, and being treated like a criminal. If you don’t believe that, simply ask former National Laboratory employee James Doyle. That de facto law is called WPN-136. It’s had a devastating impact on legitimate discussions of nuclear proliferation in this country, and many countries in the world don’t consider the U.S. to be particularly forthcoming as a nonproliferation partner. An expanded topic for this year’s conference is the role of Christian evangelicals as a force multiplier of the Israel lobby at the ballot box. The Israel lobby’s stewardship of this group has been underway for a very, very long time. AIPAC has been courting such groups since the late 1950s and early 1960s, when AIPAC was still just a little unincorporated committee inside a larger body called the American Zionist Council. This slide reveals some of their secret internal communications and outreach plans from the 1960s, when its parent was under investigation and ultimately ordered to register as an Israeli foreign agent. It’s about cultivating religious leaders, generating positive press, and counteracting opposition. There’s a reason for all of this. 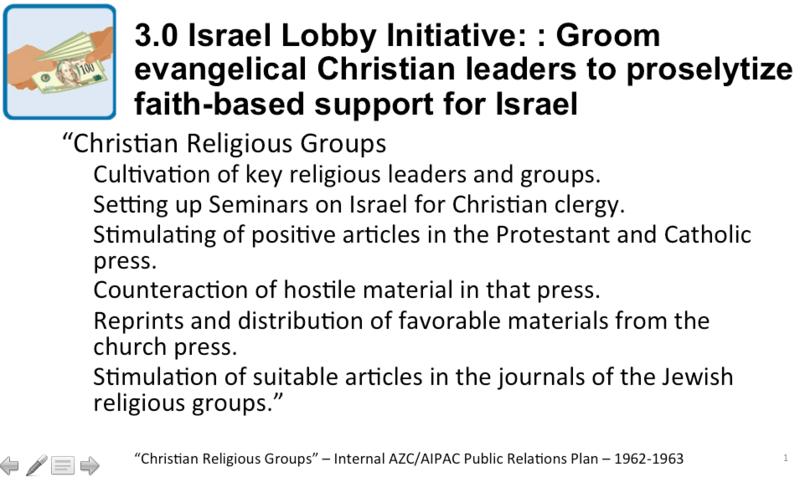 Why are Christian evangelicals so important – more important than ever, today – to the Israel lobby? Well, it’s because most Americans aren’t avid members of the Zionist movement. If you ask them in the most anodyne of terms – and nobody ever has until June of last year – “a Zionist is a person who believes in the development and protection of a Jewish nation and what is now Israel” – most Americans, 70.3 percent, don’t consider themselves to be Zionists. However, the biggest challenge to the lobby is to maintain the illusion that there’s broad grassroots support across the United States for Israel and, therefore, that the policies that AIPAC pushes are broadly popular. Among the Republicans, there’s near unconditional sympathy for Israel. It’s never been higher, in fact: 79 percent, according to the January Pew Research polling. So the Christian evangelical wing, which is highly supportive of Israel and overwhelmingly voted for Trump, has become absolutely vital to the lobby. Within the Israel lobby ecosystem it’s become a player. Christians United for Israel, the International Fellowship of Christians and Jews, are financially inconsequential if you add it up, compared to the mainline Israel lobby support organizations. But their votes are not inconsequential. Again, according to Pew, we’ve got 80 million Christian evangelicals, and 95 percent of them say that Israel is a primary or important factor in selecting their presidential candidate. Americans, despite the wide partisan split – if you look at the last platform planks on Israel in the Republican and the Democratic Party – Americans who are no longer supportive of Israel and would like a less Israel-centric policy have nowhere to go. The U.S. approach to the Middle East in terms of the Republican and Democratic Party platforms in 2016 were nearly identical – Republican planks a little bit more strident, but they’re basically asserting shared values, no daylight in policymaking between the two governments, and essentially no choice for voters. So turning Israel into a topic that’s beyond all rational debates and pre-empting other considerations in such large religious organizations is something that’s extremely important. For that reason, we’ve invited Thomas Getman, former head of World Vision, to explain exactly how this came to be. The Israel lobby expends a significant amount of resources pressuring the media in trying to shape the narrative. There are specialty organizations – such as the Committee for Accuracy in Middle East Reporting in America, Facts and Logic About the Middle East and The Israel Project – that do nothing else, such as watching who comments on C-SPAN every morning and then making a big deal out of it if it’s not particularly happy about U.S. Middle East policy. Last year, if some of you may remember, Al Jazeera undertook a major undercover investigation of the lobby and how it really operates in the United Kingdom. But they also had an undercover investigation of what was going on in the United States. This report, called “The Lobby,” presented a threat. The American Israel Public Affairs Committee and other groups were determined that Americans not be allowed to see the U.S. version. Their threats included getting the U.S. government to deny landing rights to Qatar Airways, a $10.6 billion organization with 43,000 employees. Their threats included having the Justice Department register Al Jazeera’s reporters as foreign agents, which would cut off their access to U.S. government officials and limit their access to government facilities. This pressure campaign has worked. You will not be able to see the U.S. version of “The Lobby,” which should have aired before the AIPAC meeting this year. But we’re happy to have two journalists who have withstood this kind of pressure: Ali Abunimah of The Electronic Intifada and Gideon Levy of Haaretz. Just as fierce as the battle to legally equate criticism of Israel as anti-Semitism is the drive to outlaw economic boycotts and other First Amendment activities targeting Israel to pressure it into better human rights comportment. It’s the subject of most major Israel advocacy direct mail fund-raising campaigns these days – crush BDS, BDS is anti-Semitic and should be made illegal, say these mailings. Although there have been some victories against some of these laws – one in Kansas by the ACLU, defending a contractor who wouldn’t sign a waiver saying that she would never boycott Israel in return for her contract with the Kansas State Education Department – the fight is far from over. So if you look at what’s behind the Israel Anti-Boycott Act, you’ll see that its key backer, Sen. Ben Cardin of Maryland, among his donors, top 20 2017 donors, 86 percent of the individual contributors administer, run or belong to Israel affinity organizations, including Howard Friedman of AIPAC. Among his top non-Democratic Party donors are PACs – many of them stealth PACs which have misleading names, but really only invest in Israel’s lobbying agenda and AIPAC’s lobbying agenda – which provided 31 percent of his campaign contributions in the top 20. If we continue down the line, we see that members of Israel lobby organizations – looking at his donor lineup rather than average Marylanders – are really behind Cardin on this Israel Anti-Boycott Act. There’s no popular support for it, but the lobby’s demanding it. They’ll be massing on Capitol Hill demanding that this pass. It can fine Americans up to $1 million and put them in jail for 20 years for violating it. It’s a complex law, and Americans are against it. When advised of the penalties and the fact that even the ACLU is fighting against it, 69 percent of Americans are against it. So if it does pass, the impact would be hugely consequential. Americans collectively will be pledged to defend Israeli exports from the illegal settlements, and their First Amendment activities will be severely curtailed. Finally, agenda item #6, provoking U.S. confrontations with Iran. It’s clear now that AIPAC and much of the lobby would like to see the U.S. in a major confrontation with Iran. The advocacy organizations that worked against the JCPOA, the Iran nuclear deal – AIPAC, ADL, AJC – are now the champion of a confrontation with Iran. They have a candidate in the White House who signed a Dec. 12 secret MOU to take military and intelligence actions against Iran. There’s a lot of assumption at the base of this secret agreement, if you believe the reports, and their de facto claim is that Iran has an active nuclear weapons program. Agitating for war, though, is not an easy sell, or popular. AIPAC’s operatives have worked behind the scenes and publicly to foment this confrontation. It’s important to not forget that Keith Weissman and Steve Rosen of the AIPAC espionage scandal of 2005 were essentially shopping around stolen intelligence to try to get the U.S. to attack Iran. That was the whole point of the exercise that led to their indictments. So they’re still hard at work. If you look at some public statements by the Washington Institute for Near East Policy, Patrick Clawson, he said that, “gee, it’s really hard to initiate a crisis, but perhaps we can get some sort of naval provocation in the Persian Gulf against an Iranian submarine to provide crisis initiation.” So this is what’s going on. Then, finally, the Israel lobby’s biggest and most important ask on Capitol Hill will be for massive unconditional foreign aid and state funding. It’s interesting this year that USAID administrator Mark Green will be speaking at AIPAC, and there’s probably a reason for that. There’s a potential new pool of assets. This would be U.S. aid to all of the U.N. countries that voted against the United States and condemned the Jerusalem declaration. Maybe the $38 billion that they get in USAID aid is now on the table. In fact, it may well be – and 128 U.N. member states voted against the U.S., and maybe that’s the pot of money that they’ll be going after. There is a clear demand now that the $24 billion that the U.S. promised in the Obama administration MOU is not enough. When Americans are informed of the amounts of aid that’s given to Israel, 58 percent say it’s either too much or much too much. Particularly if they’re informed that it’s been $250 billion since 1948, which is far more than the U.S. spent even to rebuild post-World War II Europe under the Marshall Plan. This silent majority is certainly not going to be heard next week. At AIPAC, politicians’ names will be called. They will be asked to rise in support of increasing aid. They know that if they do not rise and enthusiastically support this, they’ll be seeing a primary challenger and others coming after them quite soon. So 58 percent of Americans are against it, and this is consistent. When you ask the question in a number of different ways, Americans are consistently of the belief that we simply give too much foreign aid to Israel. So what can we do about it? I’m going to be giving a few ideas in our closing remarks about what I think we can do about it. But first I think we’ve got a sufficient introduction here that I would like to call up our first panel, the United Nations panel, to discuss the U.N. and these policies. Thank you very much. Previous Previous post: Ron Paul asks: Will Torture Make America Great Again?